As you can probably tell from the name of this restaurant, Snooze is not open for dinner. 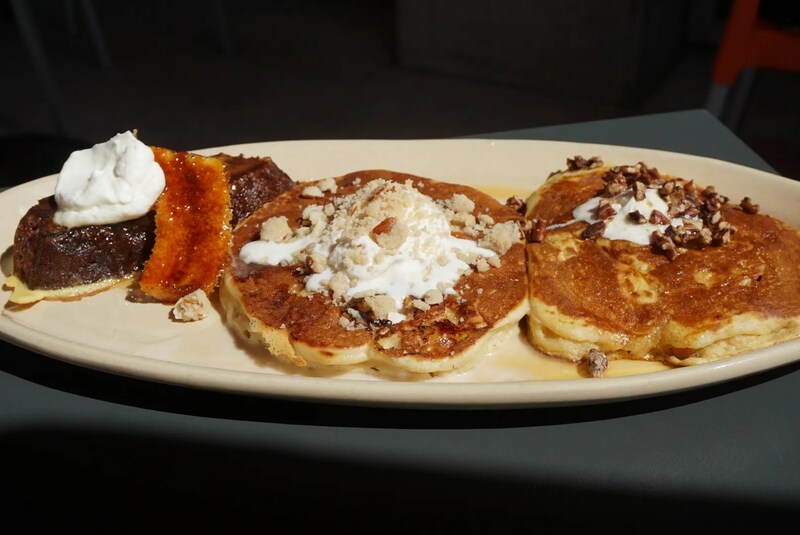 From 6:30 – 2:30 each day they serve a variety of sweet and savory breakfast dishes, like pancakes and french toast to breakfast burritos and six kinds of eggs benedict. They also have sandwiches, salads, and soups on their menu if you are feeling more like lunch than breakfast. These include things like grilled cheese and tomato soup, reuben or Cuban sandwich, and a salmon cobb salad. Plenty of choices on the menu, making it very difficult to decide what to order. I chose the regular mimosa with orange juice (in front), while my daughter opted for one made with pineapple juice. Both were good! 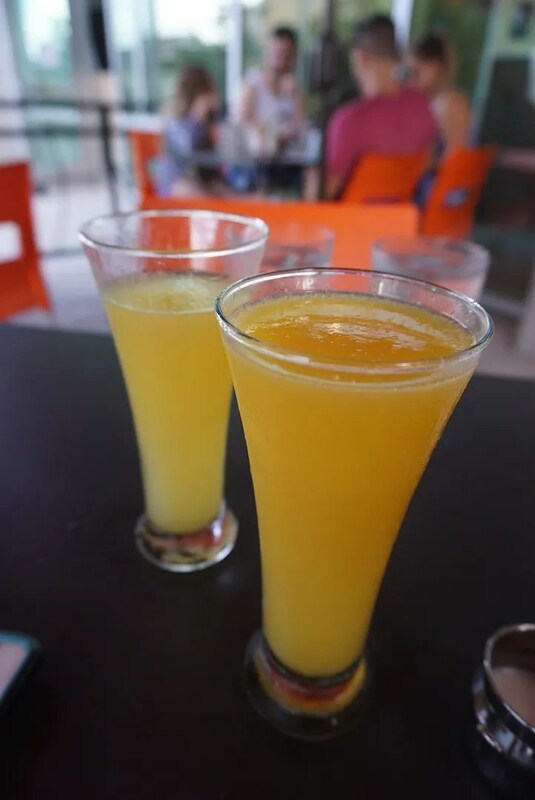 Oh, and by the way, even choosing a mimosa flavor is not an easy task here because they also offer Grapefruit, Apple, Lemonade, and Cranberry mimosas! Then we had to buckle down and make our entree decisions. My daughter couldn’t decide between the six kinds of eggs benedict, but then she saw the Benny Duo… Can’t decide?! 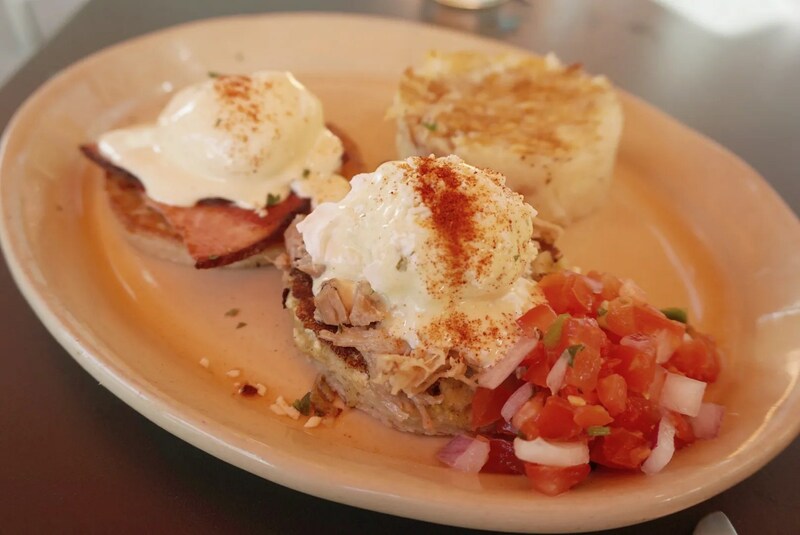 Choose half an order of your two favorite benedict offerings. 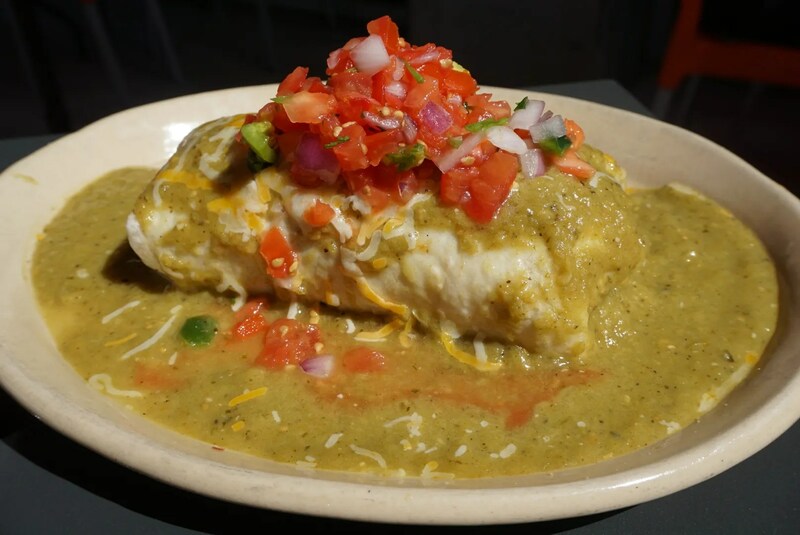 And 1/2 order Chile Verde Benny – Slow cooked pulled pork over a stack of green chile sauced tortillas and melted cheese with poached cage free eggs and green chili hollandaise, pico de gallo and cotija cheese. The Ham Benedict was good, but the Chile Verde Benny was better! 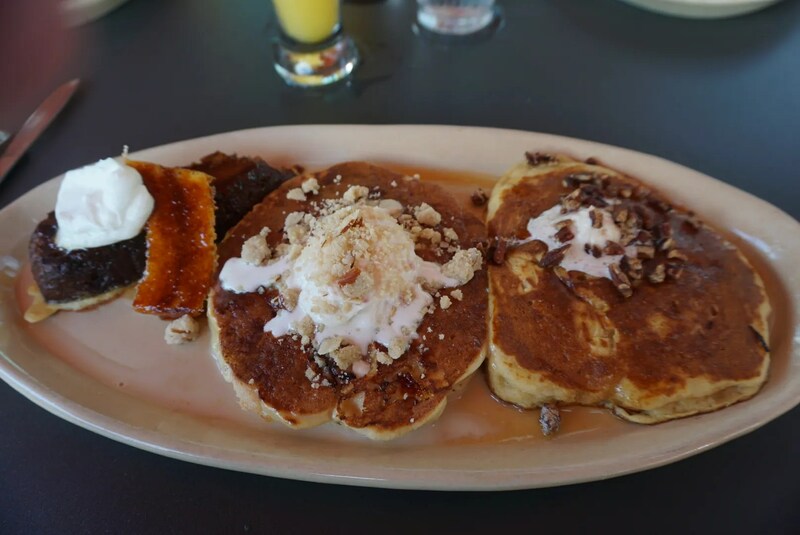 The french toast was just okay, but the pancakes were good…especially the sweet potato! He also added pulled pork to this burrito, which was one of several meat options that could be added for an extra charge. The others were bacon, sausage, ham, chorizo, and chicken sausage. You could also add these veggies too (arugula, caramelized onions, basil, cilantro, jalapeño, onion, pico de gallo, poblano peppers, wild mushrooms, red pepper, roasted garlic, spinach, tomato, and avocado). For the few things we tried, we would give Snooze a rating of 4 stars. However, we would award them another 1/2 star for having so many options on their menu plus the flexibility to combine items. So overall we gave Snooze a rating of 4 1/2, same as the reviewers on Trip Advisor. Also on Trip Advisor, Snooze ranks #132 of all the Austin restaurants reviewed there. Yelp reviewers though rated Snooze a little lower, giving them 4 stars but ranking them similarly at #139.